Note that it's 2019, and a new thread could be made. Please include a long record of ENSO in the opening post. Sea surface temperatures (SSTs) in the tropical Pacific Ocean have been at or above El Niño thresholds over the past two months. However, atmospheric indicators of El Niño remain neutral, indicating the ocean and atmosphere are not yet coupled (i.e. not reinforcing each other to help sustain the El Niño state). Five of eight model outlooks suggest El Niño levels will be maintained through to May 2018, while the other three forecast SSTs in the neutral range. It must be noted that model accuracy forecasting through the autumn months is lower than at other times of the year. Tropical Pacific Ocean surface waters have returned to ENSO-neutral temperatures after exceeding El Niño levels in November and early December. The Bureau's ENSO Outlook remains at El Niño ALERT. While waters at and beneath the surface of the tropical Pacific have been warmer than average since mid-2018, atmospheric indicators of ENSO such as cloudiness, trade winds and the Southern Oscillation Index (SOI) have not responded and have mostly remained neutral. For an El Niño to become established, the atmosphere needs to reinforce and respond to the warmer waters at the ocean's surface. This reinforcement is what allows the widespread global effects on weather and climate to occur. The recent cooling of tropical Pacific waters may partly reflect the movement of the Madden–Julian Oscillation (MJO), which has recently encouraged stronger trade winds over the tropical Pacific. However, the MJO is moving east, weakening the trade winds once again, which may allow the ocean surface to warm again. Most models indicate sea surface temperatures in the tropical Pacific are likely to remain near El Niño levels at least until early autumn 2019. Models typically have less skill when forecasting through autumn compared with other seasons. If sea surface temperatures do maintain their anomalous warmth through summer, it increases the chance of El Niño emerging in 2019. Thank you ! Looks like the 60š were a lot less in La Nina than I remembered. The 30-day Southern Oscillation Index (SOI) to 6 January was +6.2, and the 90-day SOI was +4.0. The SOI has remained within the neutral ENSO range since early September. There have been fluctuations over recent recent weeks, however during the southern hemisphere summer the SOI is more volatile due to the passage of tropical storms and should therefore be viewed with caution. New downwelling kelvin wave near the dateline. A response to the relaxed trades & westerly winds in that area the last 30 days. Yep, possible El Nino coming up later this year, the 2.4 years period some models suggest has almost passed since the last notable one. 50-50 is a fine prediction!! Major changes underway in the equatorial Pacific. Near the dateline a strong standing wave has developed. Strongest forcing yet in this ENSO cycle. There is also a strengthening subsurface kelvin wave that will have more of an impact on 2019-2020 ENSO cycle. Dateline WWB is off the charts the next 5 days coming up. Interesting to follow the VP anomalies back to early January. MJO wave passes over dateline around February 1 which triggers the strong standing wave. Hemisphere spring 2019 (~55% chance). And here are the pretty pictures thereof. Australia is still saying their is a 50% chance of an El Nino. But the USA has called it. They use different methods to determine one, with Australia having the more difficult criteria. For the U.S. (CPC) it’s basic math, this shouldn’t be that surprising. It’s not going to take much to get 2 more ONIs to complete the 5 ONIs. December and January ERSSTv5 values both came in at +0.8°C. DJF is a lock and JFM should be easy considering the ongoing off the charts westerly wind burst. -7.0 is El Nino territory. Tropical Pacific sea surface temperatures have warmed slightly in the past fortnight. In the sub-surface, weak warmth extends down to 175 m depth. Recent weakening of the trade winds in the western Pacific means that further warming of the equatorial Pacific is likely in the coming weeks to months. Five of eight climate models indicate the central Pacific is likely to reach borderline or weak El Niño levels during autumn, with four models remaining above threshold levels into winter. El Niño predictions made in late summer and early autumn tend to have lower accuracy than predictions made at other times of the year. This means that current forecasts of the ENSO state beyond May should be used with some caution. Thanks for the SOI updates Rodius. When will the El Nino be called? i've been reading in several places that it's called while i dunno whether there is single entity that counts. The USA has called it. Australia has a more complex method and they are sitting on Watch with the next review coming on March 5th. While El Nino is being talked about, Australia seems to be the Gold Standard. Wait for March 5th. Australian BOM is saying 50% chance of El Nino but that was 2 or 3 weeks ago. Looking at it now it seems more likely to be an El Nino BUT BOM also states that in Autumn there can be wild swings in the indicators. Also of note, they say that should one happen (likely now) it would be mild to moderate. If it ends up strong, I personally will worry because Australia just recorded the hottest summer on record country wide (+2.4C) with neutral conditions. El Nino increases those rises. The last record over summer was during a strong El Nino. Anyway, while I hope it isnt strong, it is only a matter of time before one comes, and when it does, the Arctic melt season could be rather bad. Synopsis: Weak El Nino conditions are likely to continue through the Northern Hemisphere spring 2019 (~80% chance) and summer (~60% chance). El Niño conditions strengthened during February 2019, as above-average sea surface temperatures (SSTs) increased across the equatorial Pacific Ocean [Fig. 1] and the associated atmospheric anomalies became increasingly well-defined. The SST index values in the Niño3, Niño3.4 and Niño4 regions all increased during February, with the latest weekly values near +1°C in each region [Fig. 2]. The anomalous upper-ocean heat content (averaged across 180°-100°W) increased appreciably during February [Fig. 3], due to an increase in above-average temperatures at depth in association with a downwelling equatorial oceanic Kelvin wave [Fig. 4]. Enhanced equatorial convection prevailed near the Date Line, while suppressed convection was observed over Indonesia [Fig. 5]. Low-level wind anomalies were westerly in the central Pacific Ocean, while upper-level wind anomalies were mostly westerly over the far western and far eastern Pacific. The equatorial and traditional Southern Oscillation Index values were both negative (-1.4 standard deviations). Overall, these features are consistent with weak El Niño conditions. The majority of models in the IRI/CPC plume predict a Niño 3.4 index of +0.5°C or greater through the Northern Hemisphere early autumn 2019 [Fig. 6]. Given the recent downwelling Kelvin wave, and the increase in both the SSTs and subsurface ocean temperatures, most forecasters expect positive SST anomalies to persist across the central and eastern Pacific for at least the next several months. During that time, forecasters predict the SST anomalies in the Niño 3.4 region to remain between +0.5°C and +1.0°C, indicating weak El Niño conditions. However, because forecasts made during spring tend to be less accurate, the predicted chance that El Niño will persist beyond summer is currently about 50%. In summary, weak El Niño conditions are likely to continue through the Northern Hemisphere spring 2019 (~80% chance) and summer (~60% chance); click CPC/IRI consensus forecast for the chance of each outcome for each 3-month period. This discussion is a consolidated effort of the National Oceanic and Atmospheric Administration (NOAA), NOAA's National Weather Service, and their funded institutions. Oceanic and atmospheric conditions are updated weekly on the Climate Prediction Center web site (El Niño/La Niña Current Conditions and Expert Discussions). Forecasts are also updated monthly in the Forecast Forum of CPCs Climate Diagnostics Bulletin. Additional perspectives and analysis are also available in an ENSO blog. The next ENSO Diagnostics Discussion is scheduled for 11 April 2019. To receive an e-mail notification when the monthly ENSO Diagnostic Discussions are released, please send an e-mail message to: ncep.list.enso-update@noaa.gov. Sitting on -15 and been there for a short while. Australia still hasnt called it.... next update is March 19. Surely they will call it now? 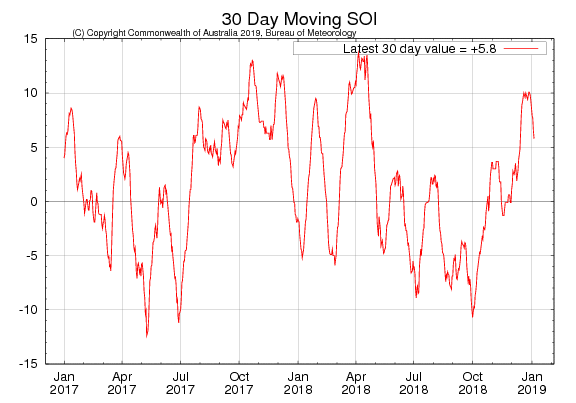 While values of the 30-day SOI have been strongly negative for almost a month, SOI values during the northern Australian wet season can be volatile, and should therefore be viewed with caution. This is because the passage of tropical systems near Darwin and Tahiti can affect atmospheric pressure at these locations, and hence the value of the SOI. The 30-day Southern Oscillation Index (SOI) has been steady over the past two weeks, remaining close to the El Niño threshold value. The SOI value for the 30 days to 31 March was −7.4. The 90-day SOI value remains within neutral territory at −6.5, but has generally been only a little below the threshold value over the past fortnight. The passage of tropical systems near Darwin and Tahiti can affect atmospheric pressure at these locations, meaning that SOI values during the northern Australian wet season can be volatile, and should therefore be viewed with caution. The Bureau's ENSO Outlook remains at El Niño ALERT. This means the chance of El Niño developing in 2019 is approximately 70%; around triple the normal likelihood. Tropical Pacific sea surface temperatures have remained close to El Niño thresholds for the past five weeks. The atmosphere has responded to the surface warmth at times, but is yet to show a consistent El Niño-like response. For example, trade winds have varied between weaker-than-average and average strength. Thanks for these periodic updates Rodius. It only takes ten minutes to do, and given how much I am learning and how much time others put into this site, this is my small contribution to the cause. One thing I am digging into for my own learning re ENSO is to get explanations for the different criteria other countries have for ENSO and maybe delve into the various effects ENSO has on different parts of the world. That is a bit bigger to do and I am not a scientist so as I am working on that, I need to ensure I have the information correct.... but when I am satisfied it is most right, I will post the information on here for others to read and discuss. ENSO is important in terms of climate change. It will being affecting the Arctic this year, and given the melting this past two weeks, ENSO might be a nail for a very low minimum this year. The US view on the 2019 El Nino - "A weak El Nino is likely to continue"
This discussion is a consolidated effort of the National Oceanic and Atmospheric Administration (NOAA), NOAA's National Weather Service, and their funded institutions. Oceanic and atmospheric conditions are updated weekly on the Climate Prediction Center web site (El Niño/La Niña Current Conditions and Expert Discussions). Forecasts are also updated monthly in the Forecast Forum of CPCs Climate Diagnostics Bulletin. Additional perspectives and analysis are also available in an ENSO blog. The next ENSO Diagnostics Discussion is scheduled for 9 May 2019.